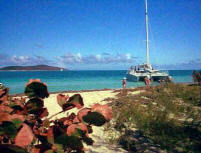 Buck Island Reef National Monument was established to preserve "one of the finest marine gardens in the Caribbean Sea." The park is one of a few fully marine protected areas in the National Park System. The 176-acre island and surrounding coral reef ecosystem support a large variety of native flora and fauna, including the hawksbill turtle and brown pelican. Visitors to Buck Island can enjoy a leisurely swim in the crystal clear waters, snorkeling or SCUBA diving through the fantastic reef to witness tropical marine life. At the eastern most point of the reef is the famous underwater trail; both novice and expert snorkelers will enjoy the passages through the reef. 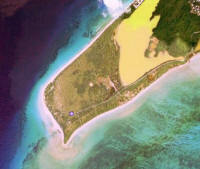 More info about Buck Island. Half day and full day trips to the island are available. Christiansted National Historic Site is located on the island of St Croix in the Virgin Islands. This park has 5 preserved historic structures and interprets the Danish economy and way of life in existence there from 1733 to 1917. Explore this unique part of America's heritage! The site is open from 8 a.m. to 4:45 p.m.. daily. The museum is open from 8 a.m. to 4:45 p.m., Monday through Friday, and from 9 a.m. to 4:45 p.m., Saturdays and Sundays. The park is closed Thanksgiving and Christmas Day. Adults - 16 and older $3. Click here for more photos. Fort Frederik was constructed in the mid-18th century by the Danish government to protect its interests in the Caribbean and to defend the western end of Saint Croix against incursion from other European powers and from pirate raids and attacks from rival imperialist nations. It was named after Frederick V of Denmark, who purchased the Danish West Indies in 1754. A sundial known as the Millennium Monument was built above Point Udall for the New Year's celebration in 2000 — it marks the azimuth of the first U.S. sunrise of that year. There is no admission charge to for the monument. Click here for more photos and information. 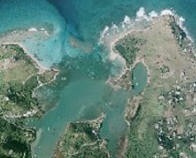 Salt River Bay is a living museum on St. Croix, U.S. Virgin Islands. It is a dynamic, tropical ecosystem with Prehistoric and colonial-era archeological sites and ruins. 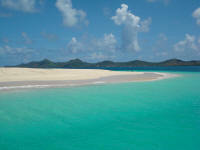 It is home to some of the largest mango forests in the Virgin Islands as well as coral reefs and a submarine canyon. Experience the beauty, sanctity and spirit of this place. Also known as Columbus Landing. Inland, coastal woodland plants dominate. Permanent and ephemeral salt ponds with associated mangrove fringe provide habitat for a variety of birds. Only open Sat. & Sun. Click here for more photos and information.